SAS Santa Claus 2018 – FULLY BOOKED! 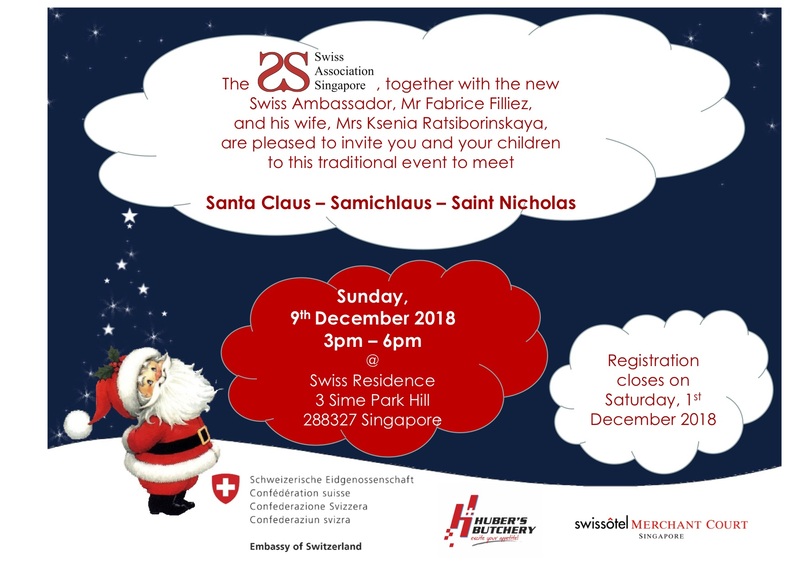 Come and join us at the traditional Santa Claus Event at the Swiss Residence to meet Santa Claus and Schmutzli and enjoy Raclette and sausages generously sponsored by Huber’s Butchery. This is a great way to get into Christmas spirit and to experience a bit of “home away from home” in Singapore. If your children like to see Santa Claus please write to ecteam@swiss-sg.org to get the “Nice and Naughty Behavior”-Form (one per child), which we need you to fill out and email back before Saturday, 1st December 2018. Cancellation after deadline or no show will be fully charged. Due to its popularity, this event is on a first come, first served basis.